collecting, found objects, old pop bottles, Vancouver B.C. 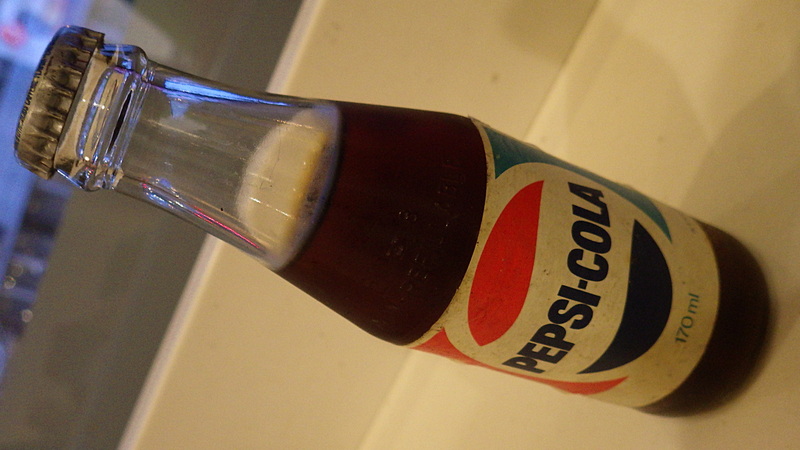 A retired friend of mine believes that the old, unopened, 170 ml glass Pepsi bottle that I dug out of the garbage Tuesday evening (November 28) was a promotional giveaway in the early 1960s. But it really can’t be older than the metrication of Canadian food labels, which took place in 1976. Personally, I wouldn’t be surprised if the bottle is 20 years more recent and dates from the 1980s, or even the early 1990s. But the exact year appears to be anyone’s guess. I found this puzzling pop bottle while I was looking for returnable beverage containers and other things of value. It was in a bag of kitchen stuff buried deep in a garbage dumpster in a Fairview neighbourhood alley. The bottle is clear glass and about 16.5 cm tall. Embossed low on the neck is a bilingual “non-refillable” statement, in English and French, along with three small symbols that resemble: “M U 8”. 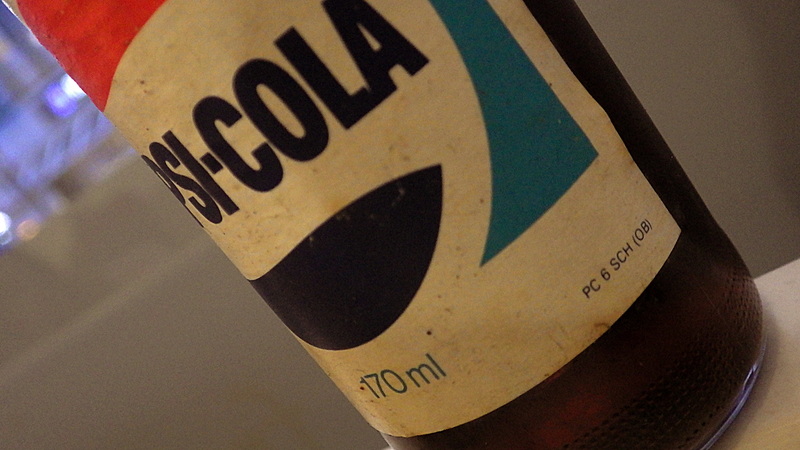 The bottle has a glued-on, white paper label printed with only three things: a spot-colour Pepsi logo (red, light blue and dark blue), a light blue volume statement reading: “170 ml”, centred under the logo and a small line of light blue text reading: “PC 6 SCH (OB)”, located off the “ml” side of the volume statement. The label lacks contemporary elements, such as a UPC barcode, a bottler’s statement, or any nutrition information. The ingredients are printed in un-punctuated U.S. English around the crimped circumference of the bottle cap: “carbonated water sugar color phosphoric & citric acids caffeine flavor”, followed by the same in French. 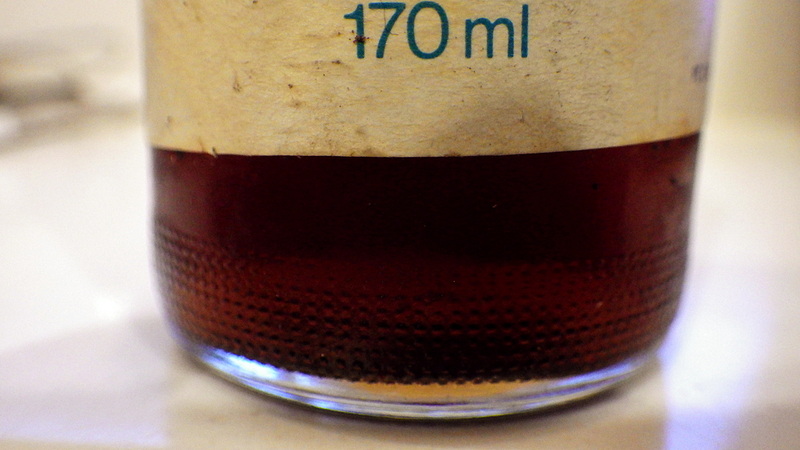 It turns out that nothing on the old bottle—or not on it, for that matter—can help narrow down just how old it is. UPC barcodes on food packaging were widely adopted in the United States beginning in 1973 but it’s not at all clear when they finally became standard on Canadian food packaging—the Globe and Mail says that many Canadian retailers did not embrace barcodes until the 1990s. And I’m surprised to read that nutrition labeling became mandatory for all prepackaged foods sold in Canada only at the end of 2007. 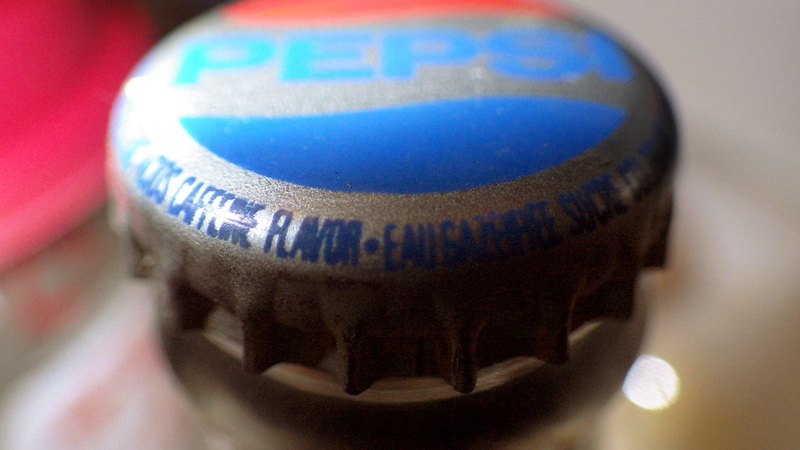 Unfortunately, there is no collectors “scholarship” on the Internet—as exists for many collectables—to help one identify the age of an old Canadian Pepsi bottle by its markings. This strongly suggests that there is little or no collector’s market for such pop bottles as the one that I found in the garbage. And indeed, there are few to be found for sale online. 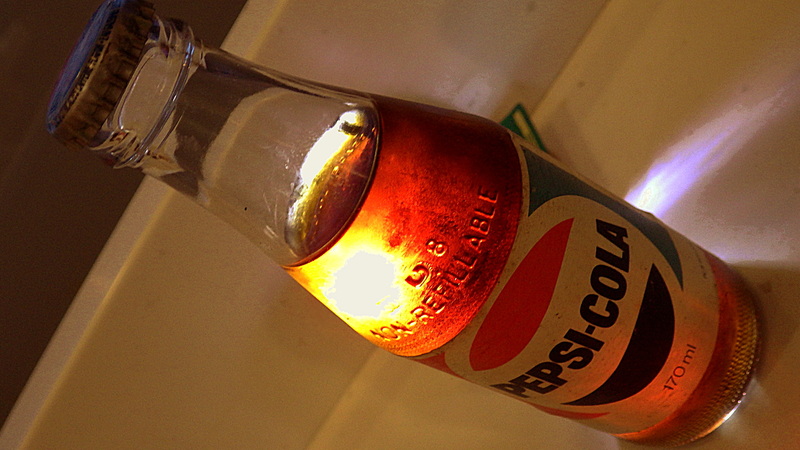 One—simply described as an empty “vintage” 170 ml Pepsi bottle—was going for a little more than $10 on Ebay. I’m mindful however, that the virtual and literal scarcity that I see could alternately be evidence that I’m sitting on an absolute, one-of-a-kind, goldmine (at least a caramel-coloured one). So I have arranged to leave the Pepsi bottle in the safekeeping of one of my non-homeless friends, just in case this advertising, I mean this blog post, leads to a flood of interested offers. Click the images to enlarge them. Of course that’s true. I forgot to put that in the post. I shall rectify my omission. Thanks.